This multicurrency strategy simultaneously determines the strength of the trends, entry points and the take profit levels for each trade. 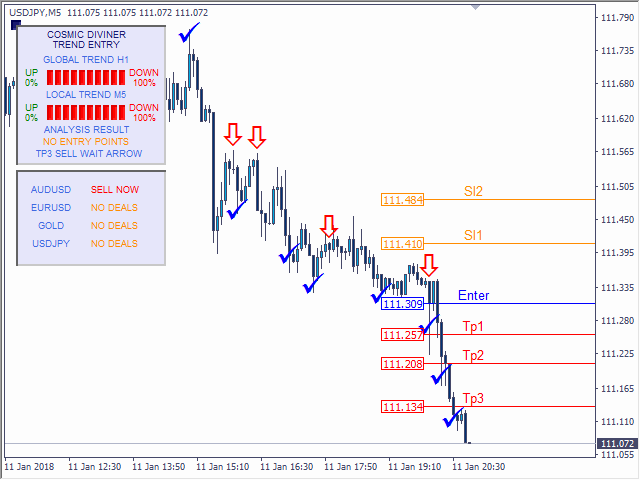 The indicator can determine entry points on any trading period from M1 to D1. For the convenience of users, the indicator renders the entry point (in the form of an arrow), recommended take profit levels (TP1, TP2, TP3) and the recommended stop loss level (SL1, SL2). The options for using the strategy are described below. The take profit levels (TP1, TP2, TP3) are automatically calculated for each trading period, depending on the volatility of the currency pair the indicator is running on. The strength of the global and local trade trends is calculated using a variety of original formulas and algorithms, which allows determining the market entry points with maximum quality and efficiency. Global Time frames (Recommended to choose an older local TF) - global trading period, we recommend using a period or two higher than the selected Local Time frame. Global Trend Power % (Recommended from 60% to 100%) - global trend strength to determine entry points. Local Trend Power % (Recommended from 60% to 100%) - local trend strength to determine entry points. Alert and Sound - alert and sound. Only sound - sound only. Template Indicator - template of the indicator. Push-notification Enter - push notification. Push-notification TP1, TP2, TP3 and Close Order - push notification for TP1, TP2, TP3 and order closure. Mail notification - receive notifications on the indicator signals by Email. The Cosmic Diviner Trend Entry indicator never redraws its values. Up arrow - buy signal. Down arrow - sell signal. 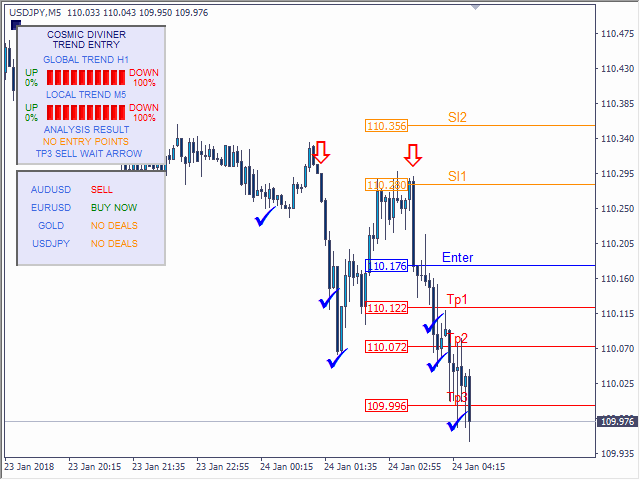 Level TP1 - the first take profit for Scalping target. 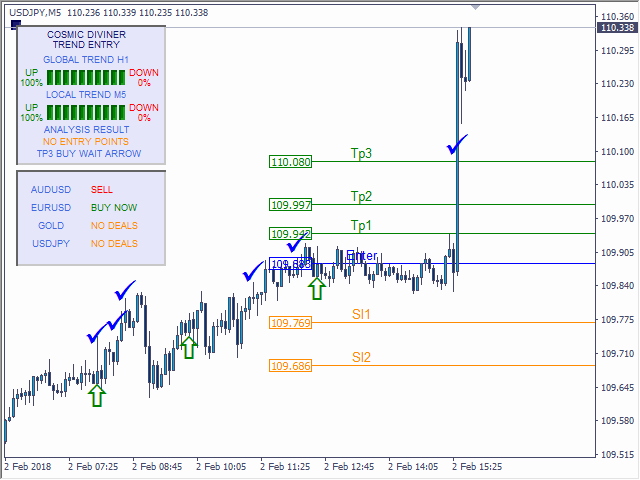 Level TP2 - the second take profit for Middle target. 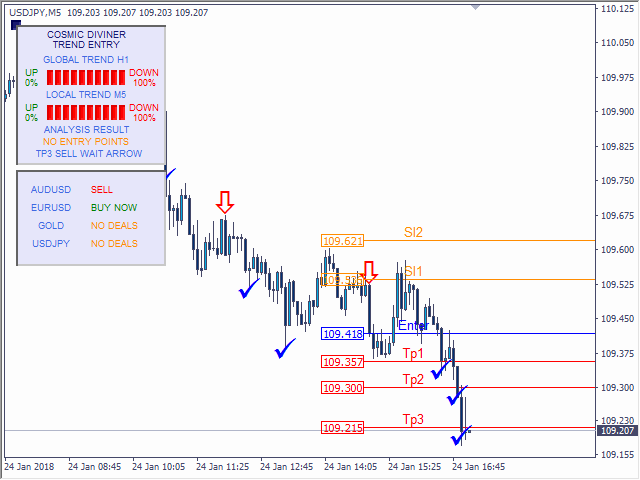 Level TP3 - the third take profit for Max target. Level Sl1 - stop loss level 1. Level Sl2 - stop loss level 2. Local period - M1, M5, M15. open an order at signal - when the price reaches the ТР1 level, close the order manually. open an order at signal, set ТР2, SL1; when the price reaches the ТР1 level, move SL to breakeven (order opening price). open an order at signal, set ТР3, SL2; when the price reaches the TP2 level, move SL to breakeven (order opening price), then wain for the order to close. Local period - М30, Н1, Н4. open an order at signal, set ТР3, SL2; when the price reaches the TP1, TP2 levels, move SL to breakeven. open an order at signal, set ТР3, SL1, wait for the order to close. Good indicator. Plain and simple. No complications! Excellent an profitable indicator. Top quality product. 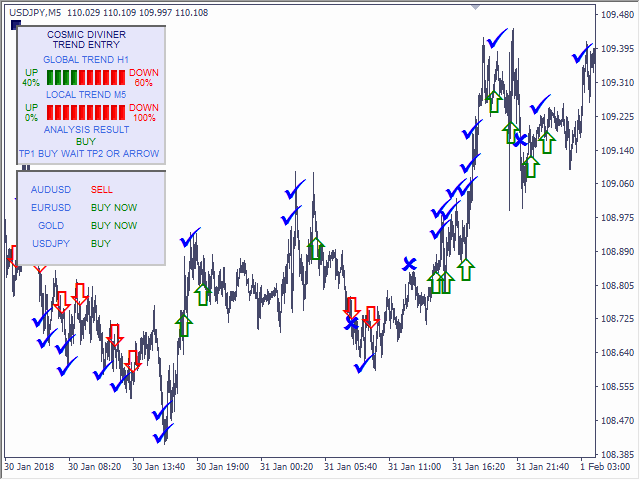 I like an indicator that gives specific entry and exit points. The push notifications work well for my phone so whereever I am I can set up the trade and with the entry and exit points factored in and not have to worry or watch over it after that. Works well for me! I purchased the indicator based on these 5 star reviews and its not what is promised/advertised. You have to install the indicator on every time frame for every currency you trade so its really cumbersome.So unless you feel like running loads of charts in the background with the indicator go ahead and move on and find an indicator that actually has a scanner and monitors all the pairs. If you pick 1 or two charts or time frames you will have virtually no trades. The few trades I took I got stopped out on - then I monitored a few and the same thing. When I complained I was told I trade wrong . I have now asked several times for her to give me the currencies and time frames that this indicator is optimized for but I get the run around. Maybe one of the 5 star reviewers can give me the pairs and time frames they do so well on. Keep looking ...I wish I did. This was a bigger expense than just the $129 for the indicator. I like this one so far. But if there was an EA included it would be a lot easier, especially when you don't have the time to watch the charts. One that I could set which level I want to use as SL (I prefer the SL2) and then a TP level and also a trailing stop. Just an easy EA like that would make this one really good. And also an e-mail alert for the indicator would be great when added. Which the seller said might be added in the next update. Sono alla ricerca di un rimborso che probabilmente non arriverà mai. Prendere profitto con questo indicatore non è facile come viene descritto. Non rispondono più alle mie domande,non si fa così non è un atteggiamento professionale. Muito bom, até parece mentira a proposta, pois parece bem simples. Mias é uma ferramenta bem estruturada com um nível de assertividade muito grande. 1) Would you guys recommend trading higher time frame? Any experience on those? I am thinking of D1 and trading H1. 2) I would love to buy an EA based on your strategy. Any plans to make an EA? 3) Is there a preferred trading time? The indicator keeps firing off trade signals and I have noticed there were times it just sits there because the major markets are closed and there is very little volatility. The signal is so good, Great work! Untill now, i can say for sure, 8 or 9 in 10 trades are right. So with no doubts, this is the best indicator here in mql5. If the price was $1000 or even $10000 i would bought it. thanks Olena. 2. Added ability to use the indicator together with the news filter. 1) Added email notifications - Mail Notification. 2) Added the timeframe of the signal to the Push notifications. - recommended level SL1 and SL2. - added information for setting Sl1, Sl2 to push notifications. 2) Added information panel, which displays the status of entry points in all trading instruments the indicator is running on. Added the ability to move the information panel. 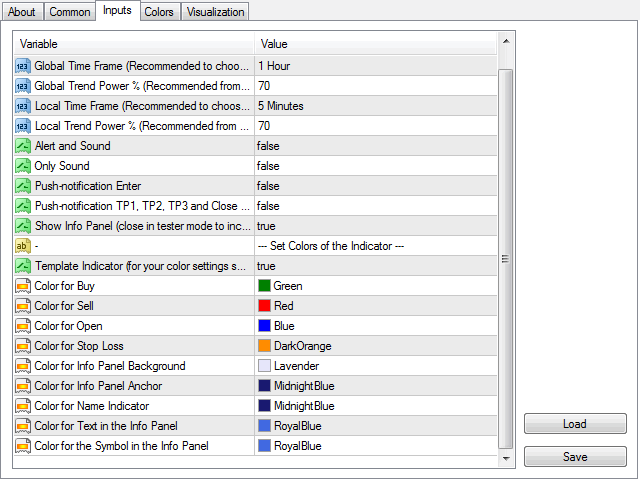 3) Added settings for changing the color of the information panel and the graphical tools of the indicator. 2) Added a check mark when getting TP1, TP2, TP3. 3) Added an information line on the status of the current situation.